The stark realities of the environmental policy challenges we are likely to face, in the United States and internationally, have not faded in the month since the U.S. election. During his campaign, I and many others were deeply troubled by the statements President-elect Trump made about Latinos, African-Americans, women, people with disabilities, immigrants and other religious groups, as well as our critical relationship with Mexico. He called climate change a “hoax”; vowed to “cancel” the Paris climate agreement; and pledged to undo the Clean Power Plan, the regulation that would put the first-ever limits on carbon pollution from power plants in the United States. Just last week, he selected a climate denier, and sworn opponent of bedrock protections for clean air and clean water, as his pick to head the U.S. Environmental Protection Agency. But in the days following the election, I have been heartened by messages of empathy and solidarity from my friends and colleagues from around the world. These messages remind me that as a community we have strength – and that we can and will keep pushing forward, together. Our resolve is greater than ever, and there are many reasons for hope. First, no one country can solve climate change alone – and thus no one election, in any country, can put the solution out of reach. A single president cannot reverse the hard-won progress of the world’s countries, who came together in 2015 to craft the historic Paris climate agreement, and met again last month in Marrakesh to continue putting that plan into action. Mexico has taken on global leadership on the issue of climate change – pledging ambitious reductions to its national emissions, and forging collaborations in North America with the state of California, and the provinces of Quebec and Ontario, among other international partnerships. Mexico’s leadership and international collaboration now play an even more critical and influential role in the global effort on climate change, and particularly in North America. And Mexico will not be alone in moving forward to develop a low carbon economy – emissions giants including China have pledged they will continue to move forward with their plans to reduce emissions, and use market-based mechanisms to get there. The transformation underway toward clean energy and low-carbon economies is unstoppable. Second, the transformation underway toward clean energy and low-carbon economies is unstoppable. In 2014, the U.S. clean energy market, which includes wind turbines, solar panels, home energy storage and energy efficiency, grew by 14 percent – at nearly five times the rate of the overall economy – to nearly $200 billion. And hundreds of major businesses just called on the new Administration to meet US carbon pollution reduction targets, invest in clean energy, and implement the Paris climate pact. Even beyond the Paris Agreement, the world is beginning to shift. The reform and modernization of Mexico’s power sector, as one example, has the potential to transform its economic and energy future in way that is both more profitable and more sustainable. California has been leading the way on climate change and energy innovation in the United States – and working in active partnership with Mexico on climate change since 2014. California’s also forged a collaboration among more than 130 subnational governments representing more than half of the world’s GDP through the Under 2 MOU. And let us not overlook that two-thirds of Americans want reducing carbon pollution to be a priority and over 80% of Americans support boosting clean energy sources such as wind and solar. Our work in Mexico has all the key ingredients we need to succeed. Our partners in Mexico, from government to civil society, are committed – as are we – to working in partnership to put our collective knowledge, expertise, creativity, and will to the task of fighting climate change – together. I know that I will, and my organization will, continue to face and fight the battles ahead for protecting our health, the climate, and clean air, healthy ecosystems, and clean water – and there will, no doubt, be many. I am extremely proud of my work and I am fortunate to come to work every day and be a part of the global effort to solve one of the most formidable environmental challenges of our time, and to work in partnership with dedicated leaders and committed citizens of Mexico. Governors, ministers, business and community leaders from across the Americas, and the world, convened last week in Jalisco, Mexico for the 2nd Climate Summit of the Americas. One year after the first star-studded summit held in Ontario, Canada, state and provincial governments reunited to showcase their achievements; highlight further challenges; and push further action and cooperation by states and provinces, as well as national governments. So-called “subnational” governments have been far more visible on the international stage of global climate action in recent years, particularly in the run-up to the United Nations climate negotiations in Paris. In 2015, California’s “Under 2 MOU” brought together a total of 135 states, provinces, and regions – representing one quarter of the world economy – to commit to reducing greenhouse gas emissions by at least 80 percent below 1990 levels by 2050. While the summit’s purpose is to highlight subnationals, Mexican federal officials, from the newly-named UN climate chief, Patricia Espinosa, to the federal Secretary of Environment and high-ranking energy officials were there to demonstrate, once again, that Mexico takes its climate reputation very seriously. Mexico has long been viewed as a climate leader on the international stage. In 2010, as the host of the global climate negotiations in Cancun, Mexico’s diplomats were lauded for pushing climate talks to break the deadlock from the 2009 Copenhagen meeting. In 2012, Mexico passed landmark federal climate change legislation. And in the run-up to the Paris meeting, when building momentum through country pledges was critical to the negotiations’ success, Mexico was the first among developing economies (and only the fourth country in the world) to formally pledge to cut its emissions. Mexico’s global climate commitments are intertwined with its national energy overhaul. Currently the energy sector produces roughly 65% of its total greenhouse gas emissions. Building out these sectors anew after decades of federal monopoly is no small task, but one on which the country has forged ahead, also setting ambitious clean energy goals, such as a goal to source 50% of electricity from clean energy by 2025, reducing methane emissions from oil and gas by 40-45% by 2025, and aiming to set up a clean energy certificates market that will begin operating in 2018. Bringing these pieces together with its UN targets requires a comprehensive plan that will ultimately ensure the emissions reductions achieved and drive low carbon economic growth. Such a plan should enable Mexico to align its climate, energy, and economic development objectives – and though a suite of policies are necessary, the country has waded into discussions of a key policy tool that some of the subnational stars of the summit know quite a lot about – capping emissions and putting a price on carbon. Mexico now has cooperation agreements with California and Quebec, which together operate the second largest emissions trading system in the world. At the Summit, Mexican federal officials signed a joint agreement with Quebec and Ontario to work toward carbon pricing. The California agreement, signed in 2014, highlights carbon pricing and the implementation of market mechanisms for reducing emissions. The agreement with Quebec and Ontario, signed at the summit on Wednesday, envisions an eventual participation by Mexico in the Western Climate Initiative. Mexico is aligning its opportunities. Trade-relationships, and other ties in the Americas are distinct advantages for Mexico in a global carbon trading world. This enviable strategic advantage needs the sustained political will and resources to build a transparent and robust system, and the vision of its policymakers and entrepreneurs to make it work for Mexico. Lea aqui la version en Español. align methodologies for estimating the social cost of carbon, a key input into understanding the benefits of reducing carbon pollution. If the June announcements were the poetry, today’s announcements were the prose — but they are no less important for it. The work plans, workshops, technical dialogues, and regulatory processes laid out in today’s announcement are the nuts and bolts of effective governing. Just as important, the concreteness and specificity of these plans give a clear signal of the countries’ strong commitment to getting these things done. The two countries also reaffirmed their commitment to work together in the International Civil Aviation Organization (ICAO) for the adoption of a robust market-based measure to limit emissions from international aviation, and to join the Paris Agreement and support its entry into force this year. Today’s announcement provides yet another illustration of the growing importance of North American leadership on climate and clean energy — one of many recent bright spots in climate action. The concreteness and specificity of these plans give a clear signal of the countries’ strong commitment to getting these things done. And it’s not hard to see why. Canada and Mexico are two of the U.S.’s top three trading partners. By advancing together, the three countries can reap the full economic and environmental benefits of a clean energy economy, creating opportunities for clean energy entrepreneurs, low-carbon investment, and sustainable economic development across the continent. Today’s announcement is a particularly strong signal from Mexico, which — with a well-earned reputation for climate leadership on the international stage — must still demonstrate how domestic policy will match those ambitious targets. Indeed, Mexico itself has much to gain from following through. With a historically oil-dependent economy, the country is already feeling the fiscal pinch of rock-bottom global oil prices. Combine that with the enormous untapped potential and newly opened market for renewable energy generation, and pathway is clear to major opportunities for economic growth through low carbon energy and efficient production. The path to shared global prosperity is a low-carbon path. By moving from the bold type of headline announcements to the finer print of detailed workplans, the U.S. and Mexico just took a meaningful step in that direction. Twelve states and provinces representing 100 million people from seven countries have committed to dramatically reduce their greenhouse gas emissions. Environmental Defense Fund (EDF) hosted the May 19 event in Sacramento commemorating the official signing of the agreement by so-called “subnational” state and provincial governments. The Subnational Global Climate Leadership Memorandum of Understanding is part of a growing momentum on climate action in the lead-up to the UN climate talks that will be taking place in Paris at the end of the year. The signers committed that by 2050 they would cut total emissions 80-95% percent below 1990 levels or achieve a per capita emissions target of below two metric tons. When California Governor Jerry Brown kicked off a three-day trade and investment mission to Mexico last week, he didn’t do it by meeting with the minister of finance (though that did come later in the trip). 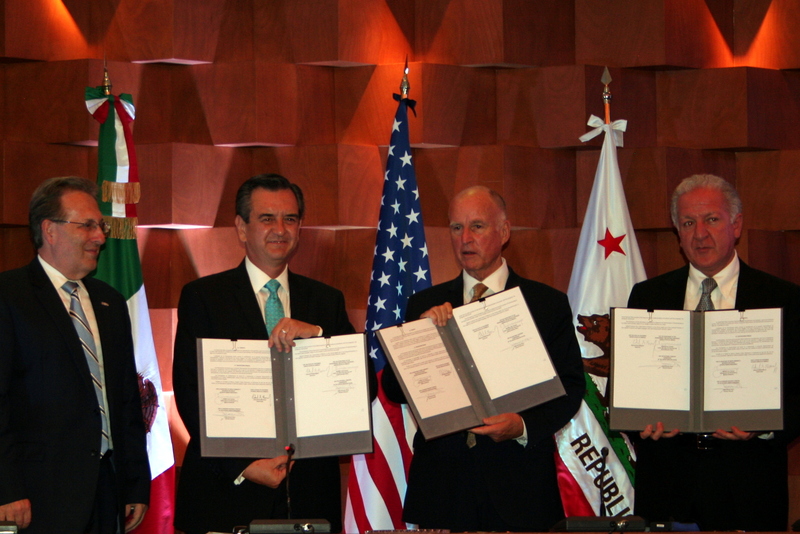 Instead, Governor Brown presided over a marquee event where he signed a Memorandum of Understanding (MOU) with Mexico’s federal Ministry of Environment and Natural Resources to cooperate on combating climate change – a key priority that complements a broader joint economic agenda very well. The Governor, staff, high-level administration officials, and legislators on the California delegation had a packed agenda that covered not only climate change, but also trade, investment, education, energy and immigration. As a participant in the large delegation, I attended official events focused on energy and climate that were both substantive and informative. Both sides spoke thoughtfully and enthusiastically about implementation of the MOU. But it was the meetings we had after the delegation had departed that gave me additional insight – and hope – that this agreement can truly signal the beginning of a new chapter in Mexico and California’s history, and one with global significance. Still, it is fair to ask: In a world where MOUs are plentiful but action often seems in short supply, why is this agreement actually, as my colleague Nat Keohane argues, a sign that momentum is growing on climate action? I provide here some perspective on what we know about California’s and Mexico’s past and potential future paths on climate change. Mexico is currently the world’s 13th largest economy, though it’s projected to grow to the 5th largest by 2050. The country boasts a stable currency, saw modest growth in the middle class over the last decade, and is California’s biggest export market. Mexico’s foreign minister, José Antonio Meade Kuribreña, had no shortage of such statistics at hand when he explained to a group of business delegates in Sacramento why Mexico is such a good place to invest and build partnerships. But Mexico is also a good place to invest in working to combat climate change. The current president, Enrique Peña Nieto, has inherited a legacy on climate change leadership, through high-profile international emissions-reduction targets and a sweeping domestic climate change law that passed just before he took office. It is also a country poised for big changes, in no small part because its congress just approved a national energy reform, with potentially enormous implications for its energy future and emissions trajectory. Regardless of whether Mexico’s climate change law passed on Peña Nieto’s watch, it is his to interpret, to implement, and potentially to capitalize on immensely. Ratcheting down Mexico’s national emissions toward the 2020 target of 30% below business as usual can be achieved by implementing smart energy and economic development policy that also drives the growth of a sustainable, low-carbon economy. There is enormous opportunity in Mexico to achieve significant, economy-wide emissions reductions (many at low cost) to meet the country’s ambitious mitigation goals and to stimulate green investment and economic growth, particularly in the energy sector. Given that opportunity, EDF staff met last week in Mexico City with policymakers, NGOs, think tanks and other experts to understand how this MOU could help propel Mexico and California forward, and serve as an important impetus for even broader ambitious action. What we heard repeatedly, especially from those close to the California-Mexico climate agreement, was optimism and a multitude of perspectives on ripe opportunities to work together. The MOU itself outlines cooperative work on policy and technical tools, such as putting a price on carbon (the price being a key ingredient to drive investment in low-carbon technologies and increased efficiency); potential harmonization of measurement, monitoring, and tracking of greenhouse gas emissions; and promoting the development of renewable energy (an area where California has enormous expertise and Mexico a huge untapped potential). California’s bet on win-wins for the environment and the economy is paying dividends, with a state economy back on track after weathering a recession and implementing the second largest cap-and-trade program in the world. And California sees the lion’s share of green investments in the country, with green job growth outpacing all other sectors ten-fold. Mexico has the opportunity to strengthen its investment in a green economy and benefit the health of its citizens and the planet, while showing itself as a shining example of global vision and leadership. And in California, it has found the ideal partner to help make it happen. Could the energy on both sides fizzle? Could Mexico’s President decide to walk away from Mexico’s climate leadership? Sure, it’s possible – but it’s hard to make a case for doing so. The very same strategies reduce emissions – improvements in technology, efficiency, increasing green investment, and making smart decisions on fuels, transportation, and infrastructure – also provide short- and long-term economic gains for Mexico, and ultimately, could do so for the entire region. Governor Brown spoke passionately last week about the reality and the urgency of climate change, and both governments reflected a sincere desire to do something real to make a difference together. For my part, I was convinced – now it’s time to get down to work. If you are looking for a sign that momentum is growing on climate action, this week’s groundbreaking agreement between California and Mexico to cooperate on climate change is a good place to start. Most of the agenda at the four-day gubernatorial event was what you would expect to find at a trade and investment mission: agreements to cooperate on education, immigration, investment, but the inclusion of serious talks on climate change was surprising and hopeful. The fact that the climate change agreement was one of a handful of issues highlighted on California Governor Jerry Brown’s trip underscores the increasing importance of climate change to economic growth. The impacts of climate change in California and the United States are becoming increasingly apparent, and Mexico faces similar issues of rising temperatures, increasing wildfires, and extreme precipitation. With the growing evidence that climate risk will bring significant economic costs in the near term, and that delay will drive up the costs of taking action, smart climate policy is increasingly a key component of sound economic policy. At the same time, the agreement also highlights the enormous opportunities for smart policy to drive clean energy innovation and investment on both sides of the border. California’s leadership on climate change has already helped to make it a world leader in clean technologies. For its part, Mexico is poised to tap its enormous potential in solar, wind, and geothermal energy to help drive economic growth and energy security. 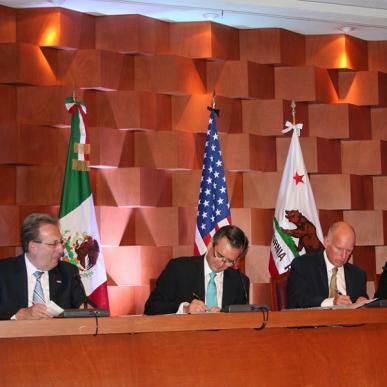 The Memorandum of Understanding (MOU), signed on Monday by Governor Brown and Rodolfo Lacy, Undersecretary of Mexico’s Ministry of Environment and Natural Resources, highlights carbon pricing as one of the key issues for cooperation under the agreement. Both sides are already taking action in this area: California’s Global Warming Solutions Act of 2006 (AB32) includes the world’s most comprehensive emission trading program for greenhouse gases, while Mexico has instituted a partial carbon tax on fossil fuels that represents an important initial step that could lay the groundwork for a more effective price on carbon in the coming years. A price on carbon is a crucial policy tool to achieve the deep emissions reductions the world needs to avoid dangerous climate change. By ensuring that the true costs of climate pollution are reflected in the price of fossil fuels, and rewarding emissions reductions, carbon pricing ensures deployment of cost-effective climate solutions — and creates a powerful incentive to develop new technologies. The agreement by California and Mexico adds another boost to the growing momentum on carbon pricing around the world. About 40 national and more than 20 sub-national jurisdictions, accounting for more than 22 percent emissions already have a price on carbon, according to the World Bank. The agreement between California and Mexico can provide a model for collaboration in the emerging “bottom-up” approach to climate change, in which national policies take center stage, rather than a “top-down” global agreement negotiated at the UN. Bilateral and regional cooperation will be all the more important in a bottom-up world, to foster greater ambition and give countries confidence that others are taking action as well. California and Quebec have already linked their carbon markets. Now with carbon pricing a centerpiece of cooperation between California and Mexico, it does not seem too far-fetched to envision a “North American carbon market” emerging in the not-too-distant future. California and Mexico face joint challenges from a changing climate. Together they can demonstrate to the world concrete progress on practical solutions to reduce carbon emissions, drive clean energy innovation and promote low-carbon prosperity.